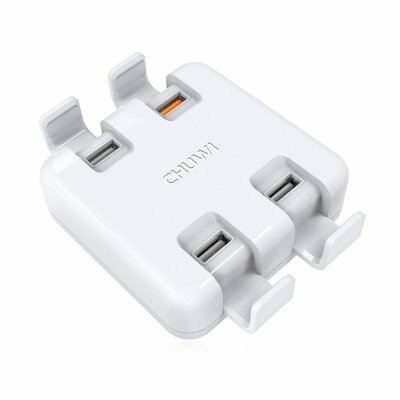 Successfully Added CHUWI-100 Power Station - 4 USB Ports, Fireproof ABS, Quick Charge 3.0, USB Port Cover, EU Plug to your Shopping Cart. Charge up to 4 electronics in the blink of an eye with this beautiful CHUWI-100 power station that features 4-USB outputs. Thanks to its compact and lightweight design, you’ll be able to easily carry your gizmo around anywhere you go. It is perfect for in the office or at home. From now on, you’ll always be able to charge your smartphone or tablet. Thanks to the latest technology, the CHUWI-100 power station charges up to 4 times faster than conventional chargers. Therefore, you’ll literally be able to power up your battery at lightning speeds. Your USB charger comes with a unique design that features switches to cover up the USB slots. This prevents dust from entering your charger. When you have opened the switches, these can alternatively be used as a stand to hold up your tablet or smartphone. This allows you to comfortably watch a movie on your device while simultaneously charging its battery. Your power station comes with an anti-slip layer so you won’t have to worry about it sliding away while using it to hold up your device. The CHUWI-100 power station has been crafted out of durable and fireproof ABS material. It meets universal safety standards that guarantee you to a safe usage. You are furthermore treated to low power consumption. This lets you use your power station for charging up to 4 electronics at once without wasting any energy. Whether it’s a tablet or phone, from now on you’ll always have the means necessary to recharge your battery in the blink of an eye. The CHUWI-100 power station comes with a 12 months warranty, brought to you by the leader in electronic devices as well as wholesale electronic gadgets..